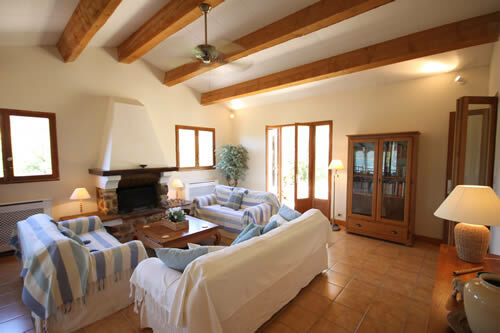 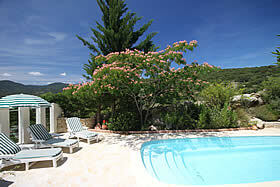 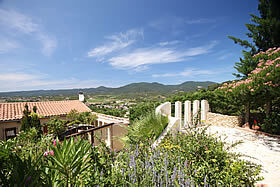 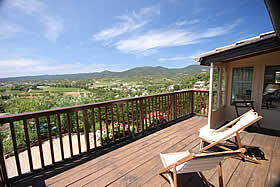 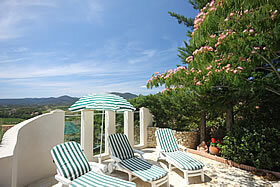 L’Arbousier is a charming, delightfully spacious, and light- filled holiday villa. 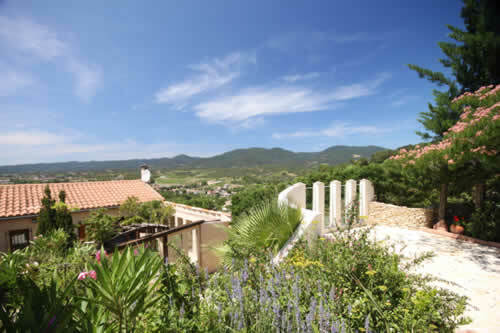 Built into the hillside with spectacular views over the Vernazobres valley, this holiday home-from-home is peacefully located, but less than a five minute drive to the centre of Saint Chinian. 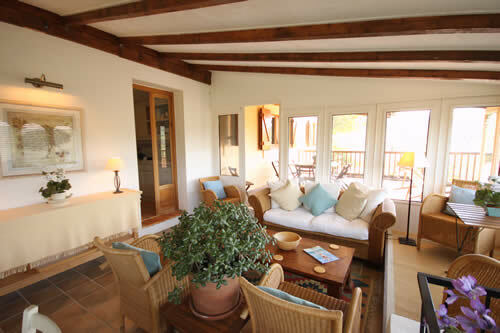 With a sheltered swimming pool, terraces and gardens, four bedrooms and three bathrooms to sleep up to eight, this is a house in which to truly relax and restore the spirit. 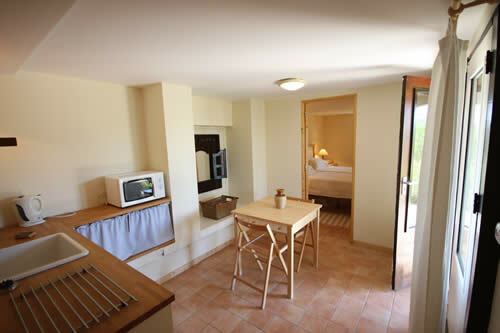 Wifi internet access. 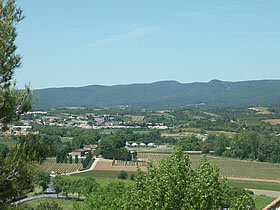 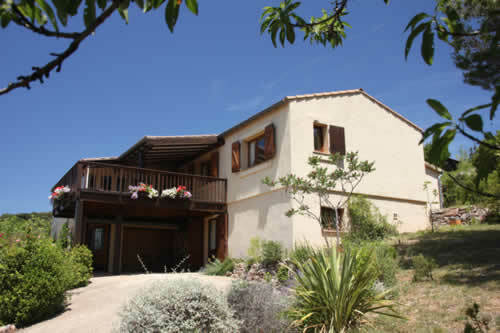 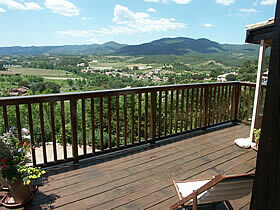 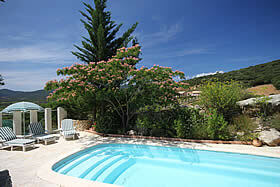 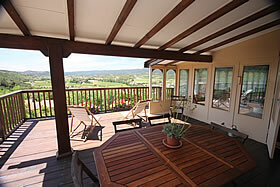 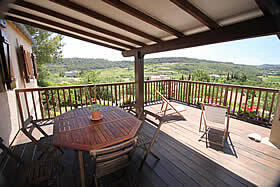 L’Arbousier is built on two levels, with the upper level being the main living accommodation. 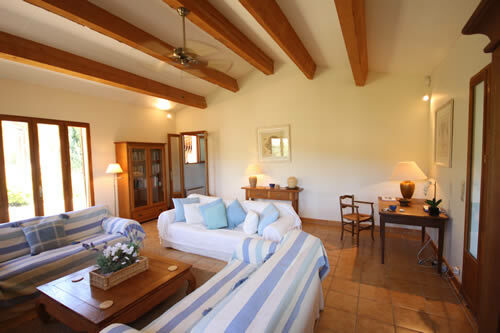 Coming up the staircase you enter into the sunroom, furnished with comfortable rattan furniture and a large dining table seating eight. This large, airy room has magnificent panoramic views over the valley and is a perfect place in which to relax during your vacation in Languedoc or enjoy a leisurely meal at the end of the day whilst watching the sun dip behind the hills, creating breathtaking sunsets. Leading off this room is a large sun deck, partly covered, with an outdoor table and again seating for eight. 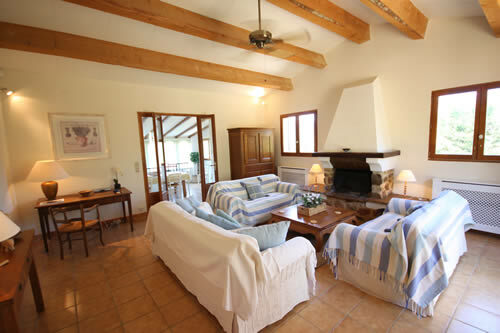 Walking into the main house from the sunroom through double glass doors, you enter into the living room - a large room with a high pitched beamed ceiling; cool in the summer and warmed in winter by a large open log fire. 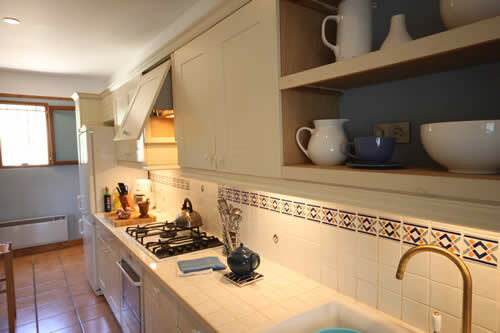 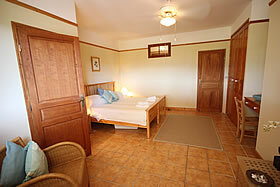 This room is very attractively furnished and can comfortably seat eight, having three sofas and occasional chairs. 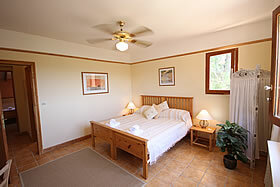 Satellite TV, radio, CD and Wifi internet access. 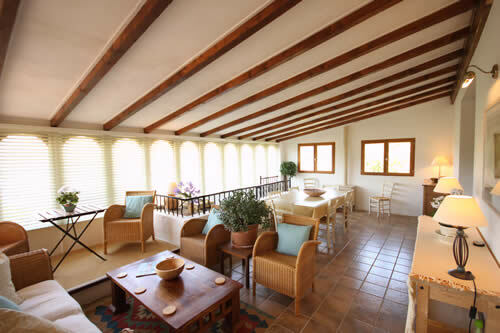 The living room has two windows overlooking the hills beyond and French doors which lead out into the colourful Mediterranean courtyard. 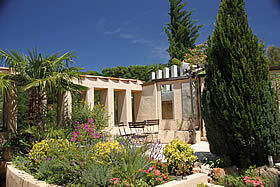 This courtyard has an abri jardin – a covered area, beautifully cool even in the height of summer. 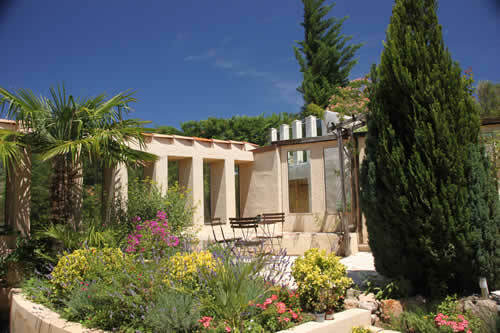 The abri jardin has a table and chairs and is the perfect place to sit to have lunch when the sun is at its highest – there is a barbeque in the courtyard and rosemary, thyme and sage for the adventurous cook! 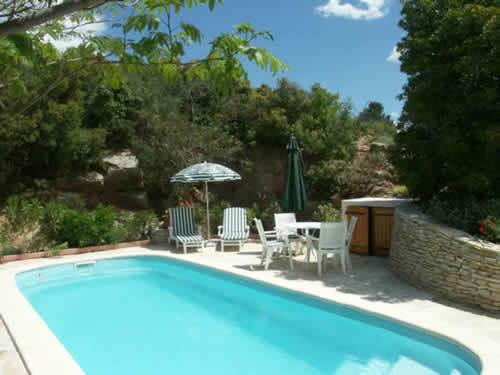 The swimming pool is just a few steps up from the courtyard garden, and is surrounded by terraces from where you have magnificent views. 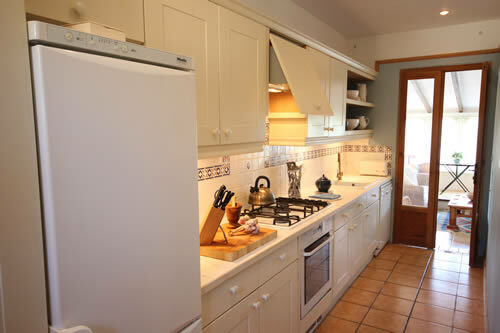 there are double glass doors which lead into the galley kitchen – fully equipped with electric oven, five burner gas hob cooker, fridge freezer and dishwasher. 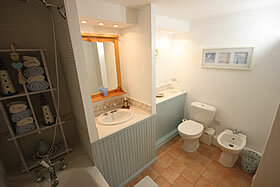 A washing machine is provided downstairs in the laundry room. Beside the kitchen is a cloakroom with WC and washbasin, and beyond, the corridor, leading to the bedrooms. At the opposite end of the kitchen a glass door leads into the sunroom. Bedroom 1 is a large comfortably furnished room with a king size double bed, built-in wardrobes, and window overlooking the sun deck and valley beyond. This room has an en suite shower, WC, bidet and washbasin. 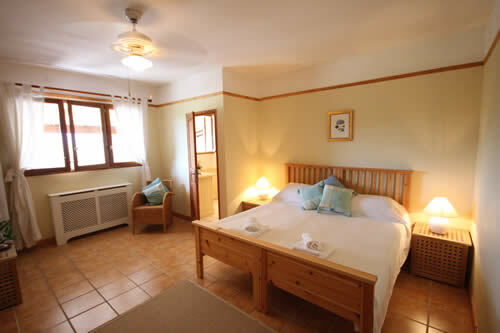 Bedroom 2 is a very comfortably furnished room, again with a king size double bed built-in wardrobes and windows on two sides - this room shares bathroom 2 with Bedroom 3. 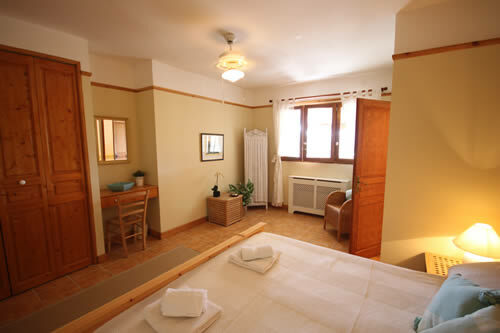 Bedroom 3 is a delightful room, well furnished with two three-foot twin beds (these can be clipped together to form a double bed), and double glass doors leading to the abri jardin - a beautifully cool area even in the height of summer - and to the courtyard beyond. 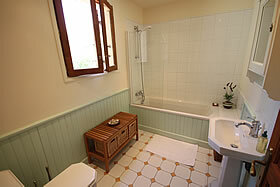 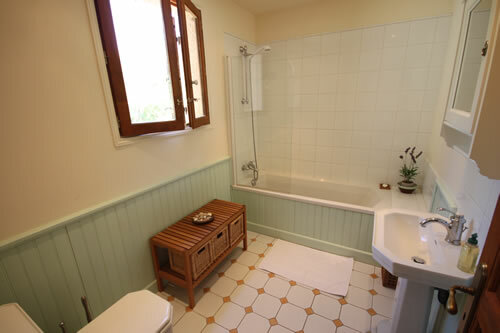 Bathroom 2 is equipped with a bath with overhead shower, WC and washbasin. 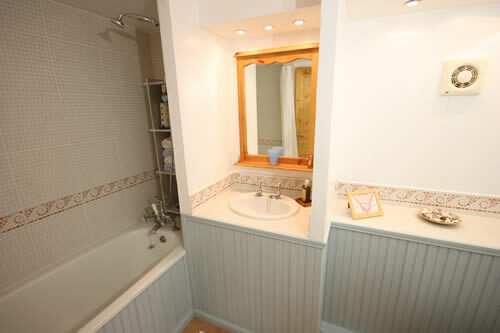 On the lower level of the house is a self-contained studio apartment, offering privacy, whilst still being part of the house. 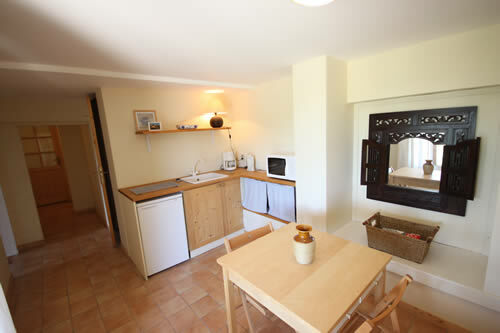 The bedroom is approached via a small living area with kitchenette, equipped with a microwave, fridge and coffee making machine - perfect for those wanting an early breakfast before the remainder of the house are about. This room has double glass doors looking out over the valley and beyond to the hills. 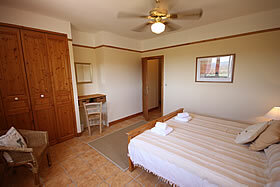 All the rooms have electric heating for all year round rentals. 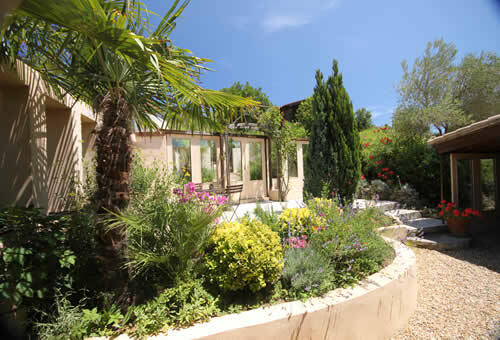 L'Arbousier has much to offer for your holiday - whether you are lying by the pool soaking up the rays of the sun beside the Strawberry Tree, from which L'Arbousier takes its name, or in the cool abri jardin, quietly reading a book in the shade, or sitting on the sundeck watching the changing light of the sky, the magic of the area cannot fail to touch you. 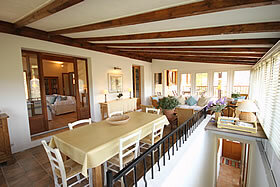 Every care has been taken to make this holiday home a home-from-home. 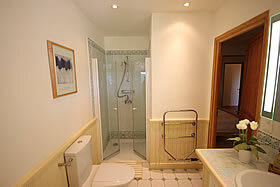 Refundable security deposit of £200.00 payable with the balance of the rental.